When you try to reuse everything you can and you also have a garden, you start to think about garden upcycling. There are so many products around the home that can be reused in the garden. 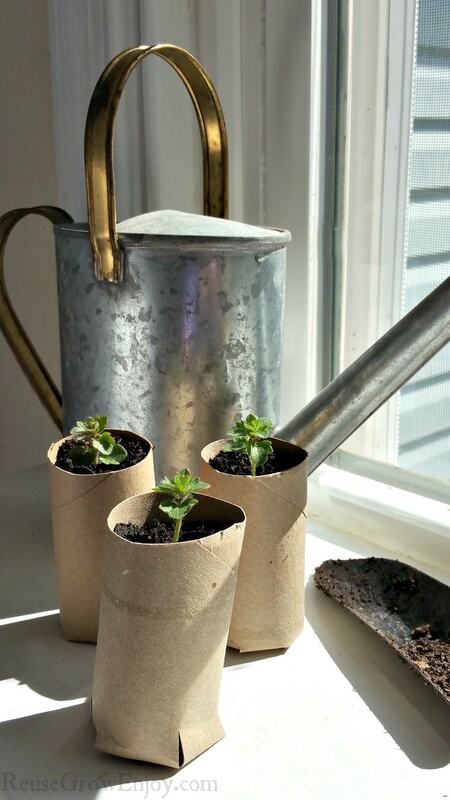 Not only is garden upcycling great for keeping things out of the trash, they really do come in handy. They can also save you a ton as you do not have to buy special garden items at the store. Some items are great for using in everyday gardening functions such as seed starters, waterers, greenhouse and so on. 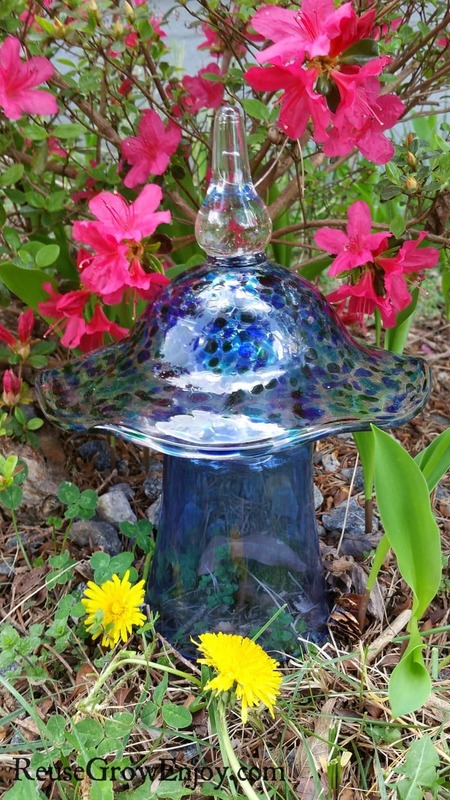 But there are also lots of items that can be used as decorations in the yard and garden as well. Below we will cover a little of both types of garden upcycling ideas. Milk jugs are great for upcycling in your garden. They are super handy for transporting water. You can even punch a few holes in the cap and have your own upcycled watering can. 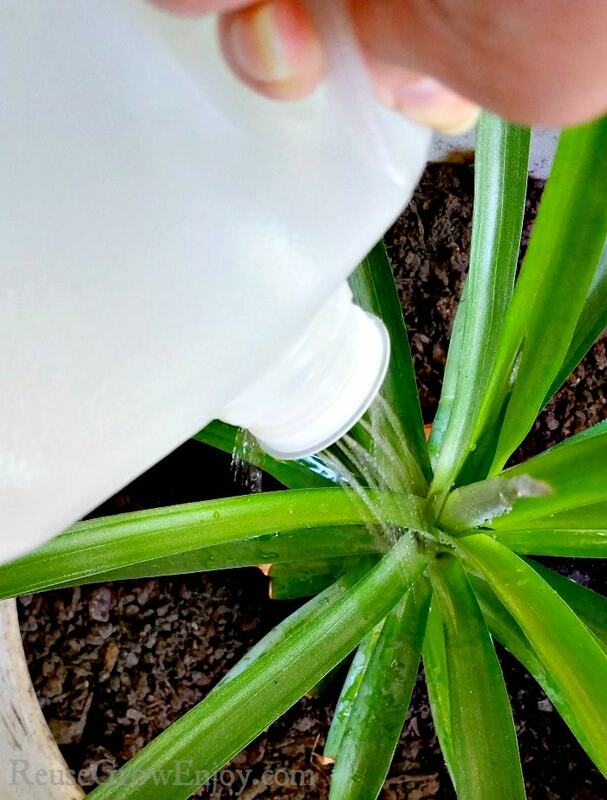 You can also cut the top off of gallon jugs for a pot. That is a great option if you want to sell some potted plants. Half gallon jugs are easy to cut into homemade scoops for soil, fertilizer, and compost. Or you can also use them to for smaller pots too. Soda bottles make great watering devices for water-hungry plants like tomatoes. Poke a few small holes along the sides of your bottle and bury with the top sticking out where you plan to plant your water hungry plants. Then fill the bottle and put the cap back on to prevent evaporation. This is particularly handy if you plan to go on vacation or if your area is prone to drought. Because the water seeps out slowly into the soil so that it does not just run off. Cardboard egg trays make great seed starters. When you are ready to plant cut each section apart, soak the cardboard well and put your seedlings into the ground. The cardboard will degrade and nourish the soil. You can also do the same with the cardboard tubes from paper towels and toilet tissue. If you live in a cold area old windows make great tops for cold frames allowing you to plant before the last frost and help your plants survive and thrive later in the fall. Build your raised garden bed to fit the dimensions of the windows you find. They can often be found for free when people replace their windows. So just keep your eyes peeled when you are driving around as you may spot some by a curb. Have a stack of old tires? You can use old tires to make a great stackable planter for potatoes or small multiple raised beds. No more paying to have your tires thrown away when they are replaced on the car! They also make for pretty flower garden beds. You can spice them up by painting with bright colors. You can also cut the tires to that they form petal-like shapes at the edge and look like a large flower on their own. Have an old baby crib, baby gates, or ladder that is no longer safe? These all make great upcycled trellises for your garden. You can even use them for a makeshift upcycled garden fence to keep children and animals out of your garden. Out of all the garden upcycling, I think this one is one of my favorites. Glass bottles such as colorful wine and beer bottles make great art. You can either make your own tree (or buy the premade ones online) then simply place empty bottles on the limbs. Another option is to bury them halfway in the ground around your garden bed. That ends up making a pretty garden edging. Any time you do a project around the house that uses wood you almost always end up with scrap wood. Or maybe you have an old barn or shed that is falling down there are always a few pieces you can save and reuse. They come in handy when you need to make a little garden shed near the garden to hold your tools. It also works great if your garden is beside your house and you want to cover things like cable boxes and phone boxes! 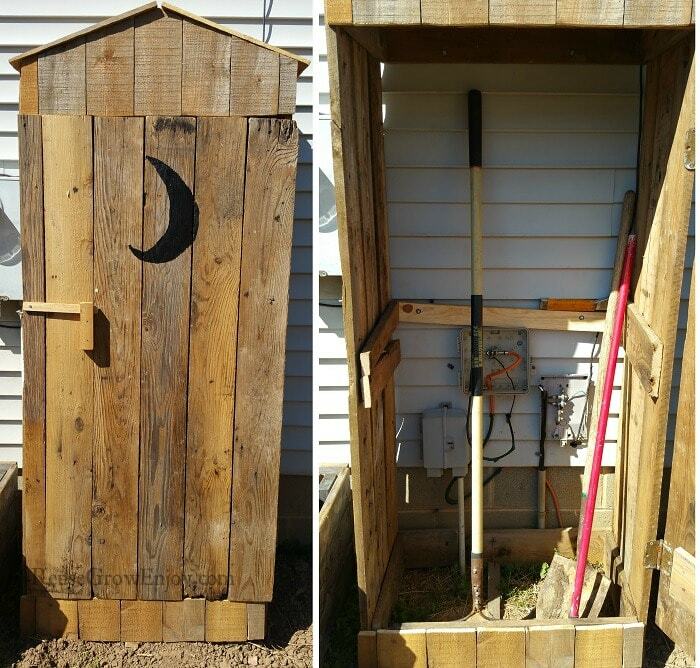 I love that the one my dad made in the above picture looks like an old style outhouse. Yes, you can reuse old shoes in the yard and garden. They make for a cute planter! Simply filly the shoe or boot with dirt and plant like you would in any other container. You can also cover the shoes in a moss mixture to encourage the moss to grow on the outside of the shoe as well. Chop up some moss you collect from around the yard, mix it with yogurt or buttermilk. Then simply rub/paint it all over the outside of the shoe. As your kiddos no longer want or outgrow their toys, you can reuse some of them in the garden. Things like large toy cars and trucks such as a dump truck can be used as a planter that you set in the garden. Fill the dirt and then plant your plants. Plastic dolls normally have a hollow head. You can cut just the top of the head off and fill with dirt. Then when the plant grows it will look like the dolls hair. There are lots of other toys that work well too, just get creative! Just like the glass bottles noted above, glasses, dishes, vases all work well for garden upcycling too. You can epoxy them together to make cute little garden ornaments as I did with the little garden mushroom pictured above. That is made from a glass and candy dish toper that no longer had a bottom. You can also make things like garden flowers by attaching plates, cups, and bowls together. Then using a diamond drill bit, make a small hole in the center to bolt them together and attach to a pole or stake to make your flower. If you are wanting some pretty upcycled garden flowers but not sure you could make your own, there are tons of options on Etsy here. I love shopping there as it also helps to support small business. These are just a few of the items you can use around the house in your garden, the options really are endless! 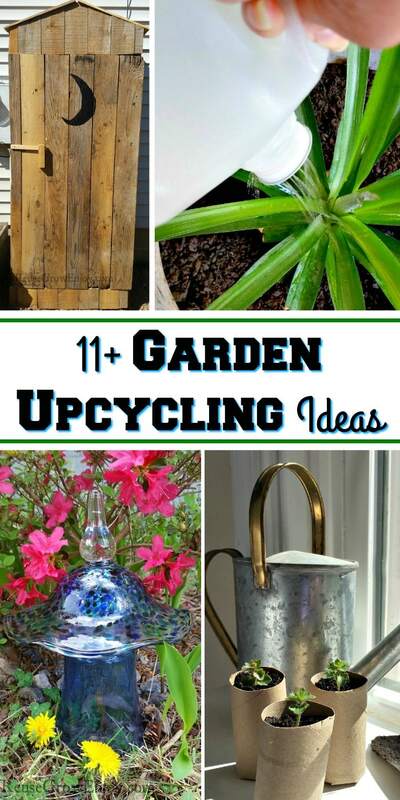 Do you have any items you love to use for garden upcycling? Feel free to share in the comments below! Here are some other helpful garden tips to check out.